Scorpions are found on every landmass on the planet save for Antarctica. In the United States they prefer the warmer climates and are common in California and Arizona. In some ways scorpions are similar to spiders. They have a reputation for being deadly and for hunting humans, but that’s not the case. Most scorpions prefer to hide, and are generally quite shy. They tend to sting when threatened, but they don’t go human-hunting and their stings are very rarely deadly to people. That’s not to say that scorpion stings are not painful. They are and people with sensitive immune systems, known allergies to other stinging pests, or with heart problems can have serious health risks with scorpion stings. That’s why effective scorpion pest control and scorpion removal should be handled by trained professionals. Since scorpions are nocturnal, you might have trouble finding them during the day, but they like to hide in small cracks and crevices, wood piles, piles of rocks and sometimes your shoes. Did you know that looking at a scorpion is like looking at a dinosaur? In fact, there are fossil records showing that scorpions have been around as long as 430 million years! They have stayed similar as they are now, which means they are very hardy insects and hard to kill. It’s yet another reason if you think your home has a problem with scorpions it’s better to call in the experts than try to deal with it yourself. Generally speaking scorpions sting as a last resort. Even when hunting they prefer to use their pincers to tear the prey apart than sting. However, humans who try to handle or reach for scorpions are liable to find themselves with a painful surprise. According to the VIPER Institute at the University of Arizona, more than 8,000 cases of scorpion stings are reported in Arizona every year. Scorpion stings can result in nerve poisoning which requires immediate medical attention. We have many types of scorpions in Arizona. Scorpions don't bite (no teeth), but they do sting. If you remain calm, it is not difficult to treat a scorpion sting. Even if you are stung by the Arizona Bark Scorpion—the most dangerous and venomous of our scorpions—it is not likely to be fatal or even to have long-lasting effects. Local medical centers are familiar with the treatment. Can You Die From a Scorpion Sting? Let's get this out of the way early. The answer is, yes, people who are allergic to stings and bites, or people who have other medical conditions or weak immune systems may die from a scorpion sting, but it is not likely that a healthy adult would die from a sting. Babies, small children, and the elderly are more at risk, but even then, fatalities are rare. Many people who contact me think that every scorpion they come across is the dreaded Arizona bark scorpion. That's not the case, but it is prudent to err on the side of caution if you are stung. If you want to be able to recognize scorpions when you come across them, here are some identifying features of the most common Arizona species. What Are the Symptoms of a Scorpion Sting? It is important to recognize scorpion sting symptoms: immediate pain or burning, very little swelling, sensitivity to touch, and a numbness/tingling sensation. More severe symptoms might include blurry vision, convulsions, and unconsciousness. What Should I Do After a Sting? Apply a cool compress on the area of the scorpion sting for ten minutes. Remove compress for ten minutes and repeat as necessary. If stung on a limb (arm or leg) position affected limb to a comfortable position. Call the Banner Good Samaritan Poison Control Center Hotline at 1-800-222-1222. They will assess the symptoms of the person who has been stung to determine the course of action. If severe symptoms are present, they will direct you to the nearest emergency facility for treatment. If a decision is made to keep the person at home, the Poison Center staff can follow up to make sure that the person is not developing symptoms that might need medical intervention or antivenin. Learn more about how the Banner Poison Control Center works. Keep your tetanus shots and boosters current. Be careful when camping or during other outdoor activities to make sure that a scorpion has not made a home in your clothes, shoes or sleeping bags. Scorpions glow brightly under UV light (black light). Scorpions are hard to kill off. If you suspect your house has scorpions, call a professional exterminator. Eliminating their food source (other insects) can help. Few people die from scorpion stings, even the sting of the bark scorpion. Scorpion stings are most dangerous to the very young and the very old. Pets are also at risk. Disclaimer: I am not a doctor. If you are stung by a scorpion and are concerned about your symptoms, call the hotline as mentioned above, contact a medical professional or go to an emergency room. Last updated: July 11, 2017 – If there’s anything you need to know about defeating a bug infestation in your home, it is that most of your efforts will be futile unless you destroy the nest itself. This similarly applies to an ant infestation. Even if you’re constantly killing or warding off the occasional ant trails with insecticides or homemade ant killers and you’re thinking “Hurray, I’ve killed off at least a hundred of these buggers!”, the truth is that there will still be tens of thousands of these bugs well and alive in their colony just waiting to swarm the next crumb of bread that you leave out in the open. Plus, a single ant queen can spawn out thousands of eggs every single day, so it’s essentially an endless battle if you don’t do it the right way. The only way to overcome this infestation is simply to wipe out the entire colony. The question then remains: How do you know where the colony is or whether you can even reach it at all? The answer is that you don’t need to. For all you know, there could be multiple colonies that exist in the many areas of your house and they are usually very well hidden in between wall cracks or hard to reach places. To kill off all these ants and their queen, there’s only one viable option and it would be by using poisonous ant baits. How Do These Baits Kill Ants? These poisonous ant killers work EXTREMELY well because of the way ants behave. Ants will be attracted to these baits via some sort of sugary or sweetening substance that is mixed in with the poison. Once they’ve eaten their fill, they’ll start carrying the food back to their colonies to be stored and shared with others. The genius of most ant baits is the fact that the poison is slow acting. This allows the ant’s sufficient time to transport these poisonous substances back to their colony before they die. The best part of it all is that a poisonous ant bait has a 2-pronged attack. If a poisoned ant dies in the nest, its body will be eaten by the others, thus spreading the poison even further. Alternatively, even if the poisoned ant dies outside the nest, the workers will still carry the body back to the nest to be consumed. Within anywhere from 2 days (for smaller nests) to 3 weeks (multiple large colonies), all the ants will be subject to the poison one way or another and this includes the queen. As if we didn't have enough critters to be worried about--scorpions, rattlesnakes, killer bees and black widow spiders--a new natural enemy has surfaced, and it is no laughing matter. The fire ant has been a hot topic of conversation since a napping three-month-old baby in the Phoenix area was killed by hundreds of stings from fire ants. This is an unusual case, and neither the Arizona Department of Agriculture nor Arizona State University entomologists have been able to explain why the fire ants swarmed in this particular situation. Since this type of occurrence is rare, it is best not to panic if you see a few fire ants. It is prudent, though, to be aware of them. Fire ants include a large group of reddish-brown to black ants. There are two types of fire ants we need to be concerned about. There are the Red Imported Red Fire Ants (Solenopsis invicta) and Southern Fire Ants (Solenopsis xyloni). In the case mentioned above, the culprits were the Southern Fire Ants, which are native to Arizona. To be honest, it is difficult for someone who isn't an ant expert to distinguish between the critters. Red Imported Fire Ants have been targeted for extinction by the U.S. government, and it has been trying for years to stop their migration across the country with limited success. We know there have been Red Imported Fire Ants documented in Arizona. According to The Arizona Department of Agriculture, our state has been successful, so far, at eradicating the highly aggressive Red Imported Fire Ant when it has been identified. Although Southern Fire Ants are common here, and not as aggressive as their Red Imported relatives, as non-experts in the study of ants we should probably treat them all with caution. After all, I've read that it takes many samples for even experts to tell which ant is which! Fire ants are between 1/16 to 1/4-inch in length. The biggest will be "soldier" ants, while the smaller ones are the "minor" ants. Fire ants are reddish-brown to black in color. 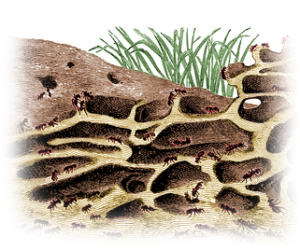 Fire ant mounds or nests may be constructed under stones, boards, or other objects. Fire ants also nest in wood or the masonry of houses, especially around heat sources such as fireplaces. Fire ants enjoy warm climates. It is common for fire ants to sting children, typically on the lower extremities. Red Imported Fire Ants are very aggressive, readily attacking anything that disturbs them. Red Imported Fire Ants have a painful sting, causing blistering. The Southern Fire Ant typically has a relatively minor sting. Of course, just like bee stings, people can have allergic reactions to ant stings that may be more severe. Red Imported Fire Ant mounds are often large and easy to spot. A mound may be 18 inches high and 24 inches in diameter. They are dome-shaped. They do not have one central opening into the colony. An extensive tunneling system is present within the mound. Southern Fire Ant nest mounds are usually much smaller. There may even be no mound at all, but rather just a series of small dirt piles. In Arizona, if you come across some fire ants, it is more likely that they will notbe the more aggressive and dangerous Red Imported Fire Ants. They are probably our Southern Fire Ant that in most cases, won't cause much harm. Fire ants build mounds in sunny, open areas such as lawns, playgrounds, ball fields, parks, golf courses and along road shoulders. When it becomes very hot (or very cold) they may move indoors. If they concern you, your local exterminator can easily handle them. There is some good news about fire ants: they are considered beneficial insects because they feed on other unwanted pests such as fleas, filth breeding flies, horn flies, boll weevils, sugarcane borer, ticks, and cockroaches. If you notice blistering occurring after being stung or after stepping on an ant mound, seek out medical advice. Some people experience an allergic reaction to a fire ant sting. Symptoms may include sweating, slurred speech, chest pain, shortness of breath, hives, swelling, nausea, vomiting, and/or shock. People exhibiting these symptoms after being stung by fire ants should get medical attention immediately. For more information you can contact the Arizona Poison and Drug Information Center at 1-800-222-1222 or 520-626-6016. The death of the infant in this case was a tragic aberration. I was unable to find any record of another death in Arizona resulting from stings of the Southern Fire Ant. You can be assured that the experts will perform their due diligence in the investigation. There's no reason at this time to believe that there is any epidemic or infestation of deadly fire ants in the Phoenix area. Yes, we have scorpions and bees that sting. We have rattlers and spiders that bite. Add fire ants to our list of desert creatures that we need to understand. Special thanks to Dale Ward of Tucson (Ants of Arizona) for his assistance with this feature. Africanized bees first entered southern Arizona in 1993. Soon after, European queen bees starting mating with the newly-arrived Africanized bees. Since that time, almost all European bees have been replaced by Africanized bees. Africanized and European honey bees look nearly identical. Therefore, all honey bees should be treated with the same caution as Africanized bees. 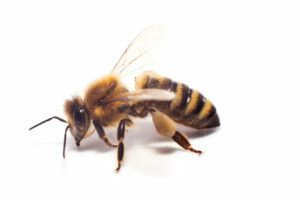 Africanized bees are known to sting in much larger numbers than European bees. This tendency to sting makes Africanized bees a health and safety risk to people and animals. New swarms and small bee hives are often gentle. However, when a hive gets bigger it usually become aggressive toward people, animals, or noise near their hive. All swarms and bee hives should be removed right away, before they become aggressive! Bee control should never be attempted by persons without professional training and the proper protective equipment. If you believe you have Africanized bees in or around your home, contact us immediately and we will send one of our experienced Africanized bee removal technicians to safely remove or exterminate them.